Mani Saemi, widely known as an Iranian painter, was born in Tehran, Iran in 1987. His passion of art emerged in the very early stages of his life which led him to work predominantly in the mediums of painting, illustration and graphic design. 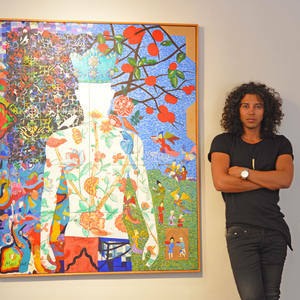 Living in a family with an artistic background helped him nurture his abilities in the field. Before he start his bachelor degree, he went to an art high school with concentration in the graphic design, Mani got his bachelor’s degree in visual communication with a focus on graphic design in 2009, beside which he pursued a degree in interior design. Through his art works, he has strived to separate himself from the intellectual bands that puts him in connection to this world. Instead, he has tried to get in touch with the world that is full of emotions and which is found in the different layers of our inner selves. The world that is the center of silence and that is defined by the colors and emotions. Tehran Institute of Technology, Tehran, Iran. Bachelor of Arts (BA) in visual communication with a focus graphic design. 2008 Solo exhibition "The Silence" Iranian Artists' Forum; Tehran, Iran. 2010 Manic group exhibition; "Painting on Clothing & Accessories"; Tehran, Iran. 2012 Painting Performance; ''Peace'', Nordstan show hall; Gothenburg, Sweden. 2014 Solo exhibition at cafe Kardemumma; Gothenburg, Sweden. 2015 Group exhibition, ''Gothenburg Museum of Art; Gothenburg, Sweden. 2015 Solo exhibition at Galleri and more; Gothenburg, Sweden. 2016 West Pride art exhibition at “City Library” Art Gallery; Gothenburg, Sweden. 2016 International Curated Art Show, July – August; Ponte de lima, Portugal. 2016 ’’Adunanza’’ International Contemporary Collective Art Exhibition September; Milano, Italy. 2016 Solo exhibition at DeLorenzi Caffé; Gothenburg, Sweden.